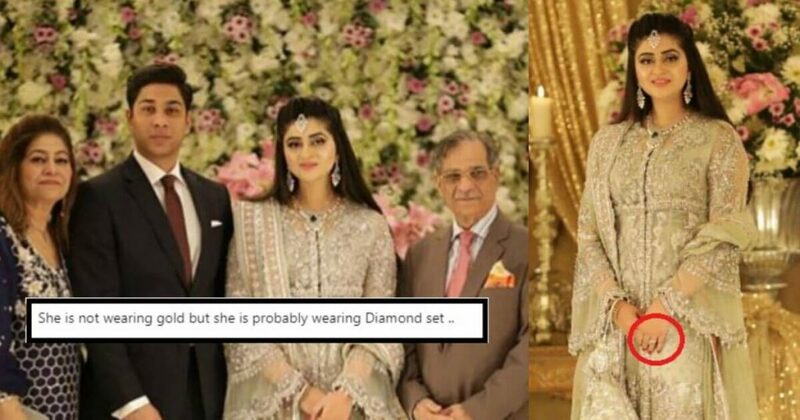 People Are Roasting The Person Who Said Ex-CJ Saqib Nisar’s Son’s Engagement Cost Rs. 7.5 Crores! Chief Justice of Pakistan, Mian Muhammad Saqib Nisar doffed off his robes on 18 January 2018. It’s been just four days since he left his seat but it seems that people were waiting for the retirement. Raising valid questions on the work in his tenure, analyzing the amendments he made in Pakistani law, examining the cases on which Nisar took suo-motu action are understandable. But here, people are creating a fuss on the money Mian Saqib Nisar collected for Diamer-Bhasha and Mahmand Dam. Ex-CJP’s son, Najam Saqib got engaged on 10 January 2018 – a few days before his father’s retirement. Najam has chosen the daughter of Lahore High Court’s (LHC) Judge, Justice Shahram Sarwar as his life partner. Although it was a private event, a few pictures of the fancy event anyway went viral on social media where only family members and close relatives were invited. Soon after Nisar’s retirement, those few pictures came under the scrutinization and social media users found a new topic to be discussed. A Social Media User (PML-N Supporter Apparently) Shared The Pictures Of Former CJP’s Son Engagement With A New Finding! According to him, the total cost of the engagement ceremony was Rs. 75 million! Not only that, but he also wrote in his tweet that Najam Saqib gifted 0.5 kg diamonds to his wife-to-be. Being a citizen of Pakistan, he used his right to ask him about the money he donated for dam fund. Here Is What He Said In His Tweet! Soon after raising these questions on a public platform, people started bashing the guy for defaming former CJP a few days after his retirement. Here Is How People Reacted To His Claims! If you have proof of this much expenditure then file a case to court otherwise it’s v easy to point fingers these days bcz of social media. Are you really sure this is 0.5 kg Diamond??? Zaalimo Jawab Do, Zulm Ka Hisaab Do! Utilization of dam funds started! Lo Jee Ab Inki Sunen! According to details, the present CJP Asif Saeed Khosa and Former CJP Tassaduq Hussain Jillani were among the guests to attend the engagement ceremony. There were many other guests from Lahore High Court and the Supreme Court as well. But these new details of the expenses of the ceremony has almost shocked everyone. Let’s wait to see what other things social media users have in their pocket for ex-Chief Justice of Pakistan.